I found this recipe on the back of a graham cracker box and immediately fell in love with it. It is easy, requires no cooking and tastes good enough for a special occasion. 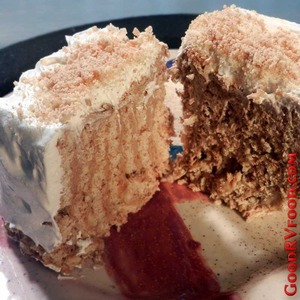 The trick to turning pudding and graham crackers into deliciously moist cake is a combination of using half the normal milk in the pudding and letting the assembled cake sit in the refrigerator for at least 4 hours so the graham crackers can soak up the moisture from the pudding. The wait works for me because I can mix this up at lunch time, stick it in the refrigerator and have a nice treat by the time dinner is over. It travels well in the RV refrigerator, but I put mine in a square Tupperware container just to be safe on rough roads. This recipe begs to be customized with different flavors and ingredients. Almost any combination of pudding and fruit works as long as the fruit does not bring too much moisture to the party. In a bowl beat the pudding mix and milk with a sturdy whisk for about 2 minutes or until all of the dry mix is dissolved and the pudding starts to get stiff. Add the bananas and 1 1/2 cups of the Cool Whip and stir just to combine. Spread about 2 Tablespoons of the pudding mixture each on 10 of the graham crackers so it is evenly covered. Stack the crackers upright on the long edge to make a square cake. The last graham cracker covers the pudding side of the end. Frost the top and sides of the cake with the remaining Cool Whip and optionally sprinkle the top with some graham cracker crumbs for decoration. Refrigerate for at least 4 hours before slicing to serve. For best presentation when serving cut across the grain to show the layers of alternating pudding and graham cracker.